Navy veteran and Peace Mission member Philip Life, a conscientious objector who served in the Navy, told Peace Mission members that he brought Divine’s message to the segregated military — and that a “Divine intervention” saved him from a Court Martial. The theme of this year’s Black History Month is “African Americans in Times of War.” Father Divine lived through several, including World War I, the Spanish Civil War, World War II and the Korean War. Because he revealed little about his early life, it’s almost impossible to know if seeing the effects of these wars influenced Divine’s message or the formation of the International Peace Mission Movement — though it seems a certainty. 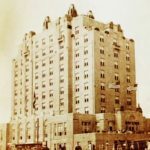 Father Divine brokered a deal to house members of the Coast Guard — provided that the troops remain desegregated — at the Brigantine Hotel in New Jersey. In the early 1940s, he heard from members of the Coast Guard who were being housed in a facility with little heat, poor bathroom facilities, and limited access to drinking water. In response, Divine brokered a deal to house members of the Guard at the Peace Mission’s Brigantine Hotel in New Jersey — on the condition that the troops there be desegregated. In return, the Coast Guard paid $1 a year to lease the building for the duration of the war. 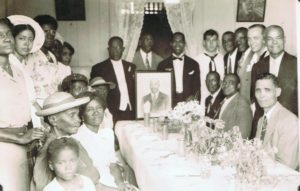 One constant, however, was that he remained a staunch supporter of civil rights — and encouraged his followers to uphold his teachings no matter where they were. According to LibertyNet, in 1992 a Navy veteran and Peace Mission member named Philip Life, who was a conscientious objector, spoke about bringing Divine’s message to the segregated military — and the “Divine intervention” that saved him from a Court Martial. At one point, Life said, his job was to type up forms for the hospital dispensary office — but he refused to include the subjects’ race, in line with Divine’s teachings. “I would designate them as to their nationality and not their race … The Captain found–out probably some of the boys from the south who didn’t like what I was doing told him,” he said.